Three people have been injured after flats were damaged in what is reported to have been an explosion. The incident happened in Whitchurch Lane in the Hartcliffe area of Bristol at about 19:50 GMT on Saturday. Several roads have been closed and emergency crews were at the scene. A woman who lives in the block of flats told the BBC she heard a “humongous bang” before her partner rescued a man on fire from one of the damaged properties. The eyewitness, who did not want to be named, said the injured man – her neighbour- was doused with water to put out the flames, but another woman escaped from the flat unharmed. She said she ran inside to get her four-year-old daughter and as they reached their garden gate “the whole house just fell in”. Another anonymous witness told the BBC: “When I arrived they were still letting people walk down the slip road, but half way down the police came and told us the fire brigade had asked us to move back further and taped across”. She said she saw “lots of debris and a large glass panel that looked as though it had been expelled with some force from the upstairs window” on the road. 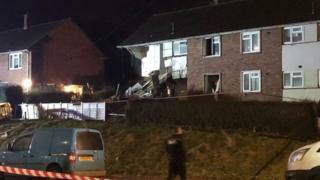 Steve Imrie, area manager with Avon Fire and Rescue, told Bristol Live: “We committed two crew in breathing apparatus to contain and inspect the fire, while other firefighters began to administer first aid to a number of persons at the scene. The cause of the damage to the flats is not yet known.